tips & tricks for Inshore fishing. Popular locations include around piers, bridges, areas where the current is necked between two points of land and expansive shallow flats areas. Grass, vegetation, and cover in combination with these locations make prime spots. 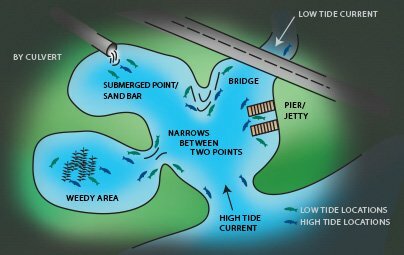 High tide is the best time to catch fish as food is washed into these shallow areas activating the fish. Popular baits include gold spoons, plastic grubs and shad. Live bait is an excellent option most times. Flashy spoons and brightly colored grubs are favored on sunny days. Predators will often herd smaller fish towards contained areas, obstacles, and the surface. If you see jumping baitfish and feeding activity, try to cast into the action. If you cannot reach the activity, anticipate its path and intercept it. Check and set the drag on your reel prior to your first cast. You do not want to lose a big fish trying to set the drag during the fight. Keep sand away from the moving parts of your reel and rinse off your entire combo with fresh water after each usage. Here are some popular approaches to Inshore fishing. This rig is effective when fishing with live or cut bait. Keep the rig near the surface and retrieve with short jerks and pauses. This will attract fish by the splashing and movement. Attach popping float to line 3' from end, pointed side down. Adjust float until you find the depth of the fish. This works best with a popping retrieve. Do not allow the grub to touch the bottom. Pass hook of jighead through grub as shown.